James Gunn is a man of many talents. Not only is he a great director, but he's also a fantastic writer. His projects are outlandish and strange, but they work perfectly in that nature. Gunn is also great to follow on social media, as he's very insightful into his creative process. A few months ago, he shared a story about a dream he had one night, of a bunch of office workers being forced to kill each other. He said he woke up, and immediately began writing The Belko Experiment in order to find out what happens next in the story. Since then, I've been very interested in seeing how this film turns out. It's not directed by Gunn, but is instead helmed by Greg McLean. I'm not very familiar with his work, but with Gunn as a producer on the movie, I trust he found the right man for the job. With the film coming out in March, which already a stacked month, I've been hoping for a trailer to drop soon. The idea sounds really cool, but I wanted to see footage from it. 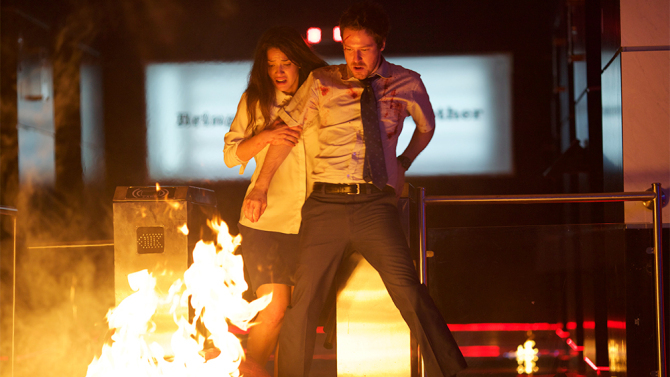 And now we have our first redband trailer for The Belko Experiment. I really liked this trailer. It's bloody, it's gruesome, and it looks awesome. People have been saying it's essentially the Hunger Games but in an office, and that's exactly what the trailer feels like. It looks like there will be some crazy action in this movie, as well as an overwhelming psychological thriller component. We don't see too much of the performances, but I think they'll be fine. I don't know many of the actors in this film, but the ones who do stand out to me are John Gallagher, Jr., Sean Gunn and Michael Rooker, and I know all three of them are great actors. So I'm not worried about the performance side of things at all. What was missing from the trailer, for me, was the sense of fun that's always in Gunn's movies. Regardless of how dark or violent a movie Gunn makes, it's always first and foremost a fun film, like Super for example. I didn't necessarily get that feeling of fun from this trailer, but I'm sure it'll be there in the actual movie. I don't think Gunn would compromise that, since it's such an integral part of his films. Anyways, I really liked this trailer, and I'm very excited to see the movie come March. What do you think? Did you like the redband trailer for The Belko Experiment? Are you looking forward to seeing the film? Leave your thoughts in the comments section below.